Ellie’s distinctive look doesn’t come without its occasional hassle, though. Sometimes people take photos in the street or shout abuse, she explains – but these people are a minority in this city. ‘Brighton made it so much easier to allow myself to express myself and allow myself to start to love myself. I was in an environment that didn’t shun me for doing that. In Brighton I can walk down the street wearing a ridiculous outfit and hardly anyone bats an eyelid and you don’t get that anywhere else. To be able to be who I am in a very loud way without many people caring is just amazing. Ellie doesn’t draw style influence from one particular source, but views anybody who expresses themselves openly as a role model, including strangers that she spots on the streets of Brighton & Hove and creatives that she follows online, even if their aesthetic isn’t the same as hers. 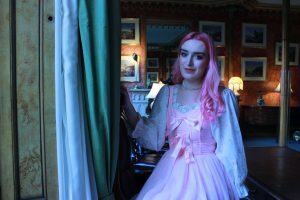 ‘Other people who dress in any way that shows off themselves as a person is inspiring.’ Ellie also looks to Harajuku street style for inspiration.